Sana’a – After a careful assessment of the current situation in Hudaydah by IOM, the UN Migration Agency, and through high-level coordination with stakeholders, a voluntary humanitarian return of 53 Ethiopian migrants was organized from Yemen. On Thursday (12/07), utilizing IOM expertise in such complicated situations, a safe corridor was charted to move the migrants from Hudaydah Seaport; a ship with proper clearances transported the 53 migrants (48 men, 5 boys) out of war-torn Yemen to Djibouti, where IOM staff will receive them and coordinate their onward journeys. “It was important to focus the evacuation on the migrants present in Hudaydah and move them as soon as possible due to the escalation of fighting around Hudaydah,” said Stefano Pes, IOM Yemen Officer in Charge. “We are pleased that we were able to evacuate them. "On a sad note, a migrant who was hit with a stray bullet in Sana'a a few days ago passed away today. This is a small example of the level of danger that migrants and the people of Yemen are enduring every day," he added. 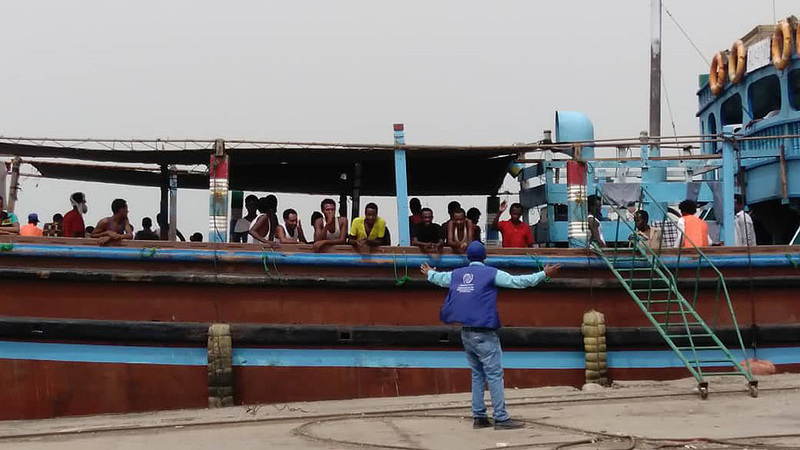 Last month (22/06), IOM announced that its voluntary humanitarian return assistance to migrants stranded in Hudaydah would be postponed until further notice, due to ongoing military operations approaching the port city. Prior to that, IOM had to cancel a scheduled return of stranded migrants which was due to occur on the 14 June. With the intensification of fighting near IOM’s Migrant Response Point (MRP) in Hudaydah, 22 Ethiopian migrants were evacuated on 19 June to Sana’a to be housed in one of the organization’s foster family locations for close observation and care. Meanwhile, IOM Yemen is continuing its humanitarian assistance to fleeing and displaced populations from Hudaydah at its Migrant Response Point, which is now serving displaced Yemenis in addition to migrants. With the support of other UN agencies, IOM has been providing the migrants with food, transportation out of Hudaydah, health care assistance, psychosocial support and cash assistance. Due to the dire need and the substantial volume of displacement, IOM has dispatched a mobile medical team to Hudaydah, in an ambulance staffed by one doctor and three nurses, to meet the emergency healthcare needs of affected populations. Five ambulances were also donated to support the population, given the shortage of medical facilities and professionals in the region. To date, IOM has assisted over 483 Ethiopian migrants with return assistance out of Hudaydah, and 1,205 Somali refugees out of Aden Seaport.